Versatile high-density blow-molded HDPE bottles are ideal for agricultural or specialty chemicals, detergents and cleaners, foodstuffs. All sizes have easy carry hollow handle, large recessed label area. 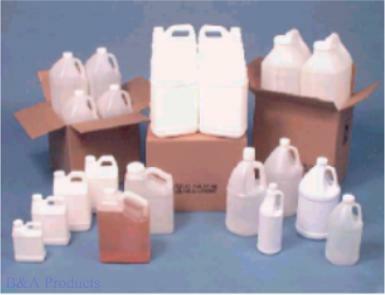 All bottles supplied with white polypropylene cap with F-217 liner. Also accepts child-resistant caps (see page 177). Highest quality available with extra strength provided at stress points. Available in bulk or in multi-pack shipper cartons.